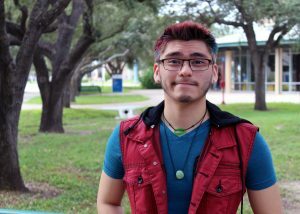 (HARLINGEN) – Tristan Leal is pursuing an associate degree in Biology at Texas State Technical College. The 18-year-old expects to graduate in Fall 2019. When the Mercedes native is not in the classroom or at the library, he participates in community service events and fundraisers as an active member of the TSTC Intramural Sports Club and Veteran Students Alliance Club. After I graduate with my associate degree in Biology, I plan on returning to TSTC to pursue a certificate in Dental Assistant and a second associate degree in Dental Hygiene. My dream job is to become a dental hygienist so I can teach proper oral health care and help people be proud of their smiles. But I do have the long-term goal of becoming a bioengineer to design and manufacture human organs such as hearts. I’ve been homeschooled my entire life, so I’ve grown up to be very introverted. Being able to step foot on campus and have social interactions has been very good for me. It has helped me break out of my shell and be more outgoing. For me, this is a huge accomplishment. My Anatomy and Physiology Instructor Paul Leonard has had the greatest influence on my success. He has always made me feel welcomed in class and at TSTC. He also eases my anxiety about speaking up in class and working in groups, along with encouraging me to get involved in campus activities. My advice for future TSTC students is to always ask for assistance. TSTC has so many resources to help students succeed; take advantage of them. This entry was posted in Harlingen on November 5, 2018 by Amanda Sotelo Sotelo.